Tehri Garhwal is a beautiful district in the Uttarakhand state of India. Tehri city is the headquarter of the district. The town is situated at an altitude of 1550 ft above sea level. The river Bhagirathi, Alaknanda, Bhilangna, Alaknanda, Ganga all these mighty river run through Tehri Garhwal. Rudraprayag district and Uttarkashi district were both carved out of Tehri Garhwal. The newly and modern Tehri town is almost 70kms from Rishikesh. This town was built when people from the old town were rehabilitated due to the building of Tehri dam in the area. Tehri Garhwal is a nature's paradise and it attracts tourist from all over the world. It is surrounded with high snow covered peaks , beautiful valleys and scenic surroundings. The beautiful district offers the tourist everything right from scenic surroundings , peaceful environment and adventure sports. 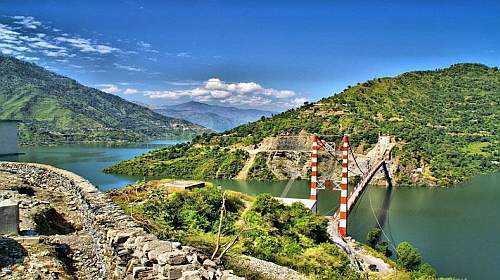 Tehri dam spans an area of almost 40 - 50 kms and has a height of 855ft approx. The dam is the fifth tallest dam in the world and second tallest dam in Asia. The dam produces around 2400 MW of electricity and provides drinking and irrigation waters to Uttar Pradesh and Delhi. Tehri Jail A permit is required from the local authorities to see the Tehri Jail. The view from Tehri Jail is outstanding. Dhanaulti ( 24 kms ) This beautiful hill station in on the Chamba - Mussoorie rd. The perfect climate and the scenic surroundings make it a perfect holiday home for the tourists. Kanatal is one of the quietest hill in Tehri Garhwal Uttarakhand. This hill station offers a enchanting view of Garhwal Himalayan ranges. Surkhanda Devi Temple , Chandrabadni temple and Kunjapuri temple around Kanatal together form the Devi Darshan triangle , which also offers ample trekking opportunities. DevPrayag It is one of the five sacred confluences in Garhwal Uttarakhand and is an important place of yatra for the Hindu devotees. Devprayag is also one of the most important of the Panch Prayags.The town lies on the Rishikesh to Badrinath route and is 87 kms from Narendra Nagar. What more to do in Tehri Garhwal? Lots of water adventure sports have now been recently started in the Tehri Dam Lake. Adventure sports such as rappelling, water skiing, speed boat racing are now available in Tehri. Leisure boat ride is also available in the Tehri Lake. Tehri Garhwal in Uttarakhand is a part of Garhwal tourism, and the local languages spoken are Gadhwali and Hindi. The best time to visit would be from Feb - April and Sept - March. Light woollens in summer and heavy woollens winter are advisable. The summer season extends from April to June. The winter season is from October to February.